The holiday season will be here before we know it. That means holiday party planning is approaching. 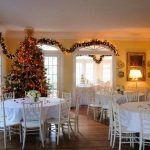 It is time to start planning and choosing your holiday party venue for those family or company holiday parties! Or even a Holiday Wedding! Winterbourne has a beautiful view of the St. John’s River with a lovely garden setting. 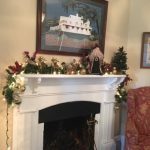 Winterbourne Inn is a perfect waterfront venue to host your holiday party. We are an all inclusive venue. We do all the catering in house and have many delicious selections for all your guest. All you need to do is plan the guest list. We are an affordable venue so you do not have to worry about breaking the bank. 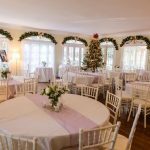 We love the holidays and take a lot of pride in making our venue festive for the holiday season. Every year we decorate with beautiful holiday decorations. This means you do not have to worry about any decorating for your event. Our staff sets up a beautiful large live tree decorated with white shimmering lights and many decorations perfect for the holiday season. Beautiful garland is hung over every french door and throughout the venue with sparkling lights. 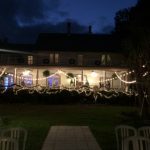 We have decorated wreaths on the balcony of the venue and white light covering the outside of our historic home that gives an extra special glow at night. We have many antique Santa’s we set out through the venue to give it an extra touch of the holidays. Our number one goal is to make sure you and your guest enjoy your special event and have fun! 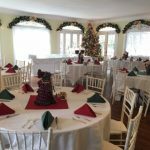 Contact us today and let us help you host a wonderful holiday party. Contact us today for information on how you can host your event with us and set up a tour. 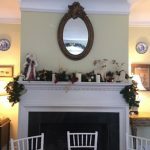 You can also check us out on our Facebook page to view additional photos and events hosted at Winterbourne Inn.